JOHANNESBURG – In a surpriseÂ MondayÂ announcement broadcast exclusively on eNCA, the Commander in Chief of the Economic Freedom Fighters (EFF), Julius Malema, said his party would offer white South Africans “blackface in exchange for landâ€. The EFF leader said his party would be tabling a bill called â€œOperation Face-Offâ€ in the coming days in response to the pursuit of blackness by some white South African students. 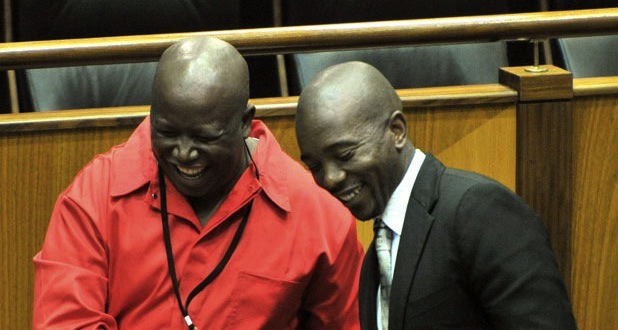 While details of the proposed bill remain sketchy, Malema said the legislation will allow white South Africans opportunities to lampoon blackness only if they readily gave up their land. Responding to the outrage against the photo of a pair of Stellenbosh University students dressed in blackface, which first appeared on Twitter, Malema further said that modern “blackface” was a neocolonial distraction created to keep blacks looking in the mirror. Abu Oâ€™Well is almost an award-winning satirist with the Daily Vox. Read more ofÂ his writingÂ here.